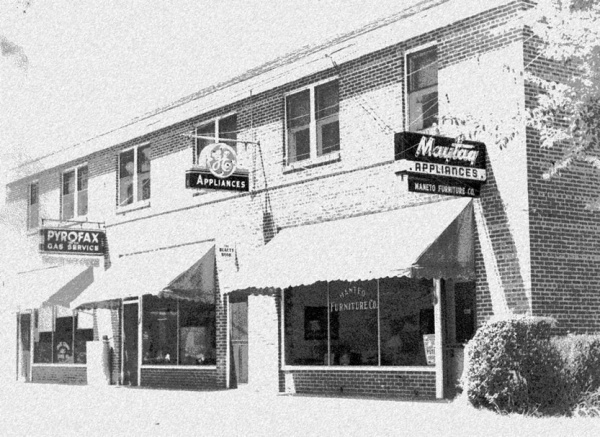 In 1945, a building, which is now the front portion (facing Sir Walter Raleigh Street) of Manteo Furniture Company; consisting of Quinn Furniture’s two showrooms, the ABC store, and four apartments on the second floor, became available for purchase. The two brothers Roy and Ab put their resources together. With a down payment borrowed from their father, two empty showrooms, no receivables, and plenty of payables, they established Manteo Furniture Company. Not ones to “put all their eggs in one basket”, Roy would remain in the service station to help bolster the family income until the furniture store was more able to support the two families. 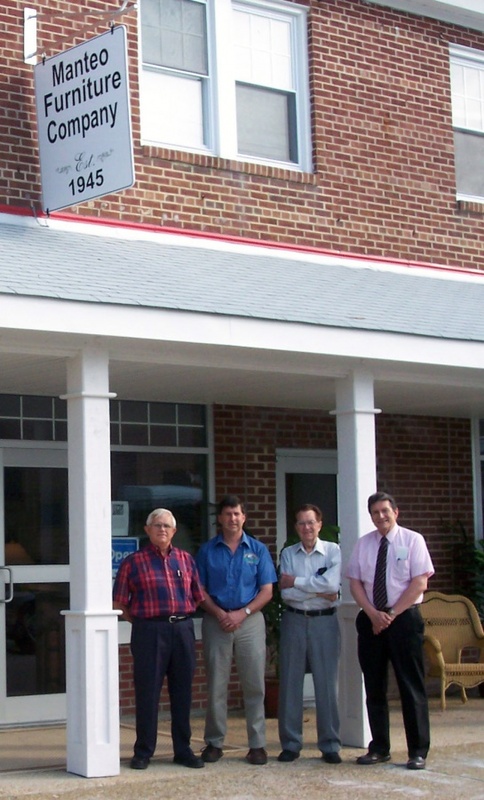 Edward “Ab” Wescott, Lloyd M. Wescott, and George M. Powell operated the business originally. In 1946, the third son, Fred M. Wescott, completed his enlistment in the navy, returned home and soon joined in the business. Things were much different in these war times. Merchandise was allotted, material for manufacturers was scarce, and a new business was strictly COD Cash. One furniture manufacturer still doing business today for example could only allocate three bedroom suits for the entire year. Sales were made going on the road and knocking on doors. Orders were taken one day and delivered the following. Owner paychecks were not always cashable. Only through the efforts of extraordinary family unity did the company survive and grow as it did. The first expansion to come soon after opening was the warehouse built on the back of the store between the store and the then Virginia Dare Transportation Company, a bus depot. A metal warehouse was soon added on the west side. In 1971, Roy Wescott closed his service station, moved his inventory to the metal warehouse and began his furniture career. Manteo Furniture Company obtained the franchise for General Electric appliances in 1947. The ABC Store moved out and this space became and is still today, the appliance showroom. The apartments upstairs were vacated, the first elevator in Dare County was installed and the upstairs became warehouse space. Fred Wescott and George M. Powell became partners and the beginnings were fully established. Manteo Furniture became associated with a Virginia Beach LP gas distributor and started sellng bottled LP Gas for home and business use. 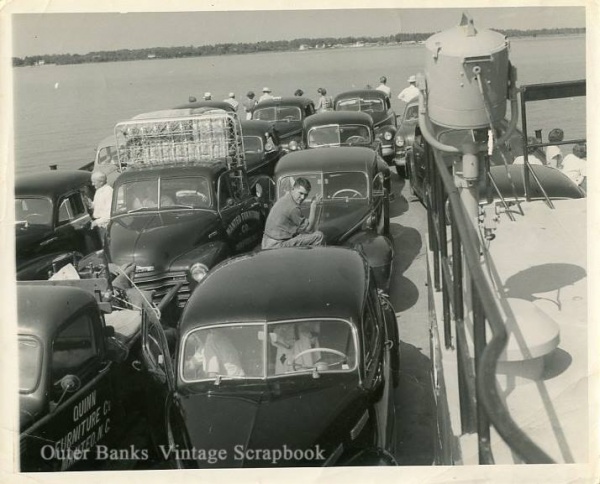 The parent company sold its franchise and the brothers then established Wescott Brothers Gas Co., operating as such for some 20 years before selling the franchise. Many hours labored and many sacrifices later, the store took hold and became a respected and successful business venture. However, fate would deal a blow from which recovery was a virtual “start over”. In 1960 Hurricane Donna did its dastardly deed and most merchandise was lost at a time when insurance against such was unavailable except in some very costly instances. The owners licked their wounds, purchased the Virginia Dare Transportation Building behind the store, attached it to the present building, built 3 foot raised floors creating additional showroom, warehouse space, and a hedge against future rising water. The company operated as is for the next 10 years. In 1970 after 25 years, Edward “Ab” Wescott decided to retire to have more time to enjoy his first loves; his wife Earlene and the water. He loved fishing, crabbing, hunting, making decoys and other wood carvings. He also learned during this period of time his special talent as an artist; creating several beautiful canvas paintings of the area. Also in 1970, John W.”Bill” Daniels, the Son-in-law of Roy Wescott, after graduation from Georgia Tech and service as a civil engineer, accepted an invitation to join the firm. Bill, with his wife, Louise “Bubbles” Wescott Daniels, returned to the Island and settled in Manteo with their children. In 1971, the Company expanded and added additional warehouse space onto the northwest corner of the store. 1978 rolled around and after 32 successful years came the retirement of Fred M. Wescott. Fred, a highly respected and loved man as well as businessman, with his wife Ann opened and still operate today, the Sea Isle Gift and Lamp Shops. Also in 1978 after 33 years of dedication and a greatly appreciated and respected appliance serviceman and co-owner of the firm, George M. Powell retired. For several years George continued to serve the people of Manteo repairing appliances from a shop at his house in Burnside. Upon Fred Wescott’s and George Powell’s retirement in 1979, stock purchases were made and the reins were ably held by Roy Wescott and Bill Daniels joined by the new co/owners. After 18 years of service with Manteo Furniture Company, Rollins Tillett joined the ranks of Co/owner along with newcomer, Joe Mathias of Corapeake, NC. In 1980 one small showroom of 480 square feet was added off the middle showroom dedicated mainly to office type furniture for the home and office. In 1984, the largest one time addition (15,000 square feet) and renovation took place. A second story was added onto the rear section creating an additional large showroom and warehouse. Renovations were made on the lower floor creating two new showrooms. In 1986, after 7 years, Joe Mathias retired to Corapeake, NC. After graduation from the University of North Carolina, Ken Daniels, son of Bill Daniels purchased Joe’s stock and became the newest addition to the ownership of the company. Joe Mathias enjoyed his retirement until he met with an untimely death due to cancer in 1991. Around 1987, The Virginia Dare Transportation CO. ceased operations. Another major renovation was undertaken and the bus station was converted to an additional showroom giving Manteo Furniture Company its present size of 48,000 square feet of 9 warehouses and 9 showrooms. In 1988, due to health, Rollins D. Tillet chose to retire. At this time, his stock was purchased by Roy Wescott, Jr., son of Roy Wescott. After selling his home in Augusta, Ga., Roy, Jr. joined the firm in 1989, returning total ownership back to the family of Roy Wescott. In 2004, business had grown to the point that more warehouse space was needed. The present site was not large enough to expand any further as we now covered the whole block. Roy, Sr. was of age that he did not want to finance any major expansions, so at that time, Bill and Ken acquired and built an additional warehouse along the road to Wanchese. Part of this warehouse was then rented back to Manteo Furniture Company. In 2006, Manteo Furniture decided it was time for a facelift. With a rough sketch by Bill Daniels and a final drawing by John Wilson, Jr. the remodeling was underway. Renaissance Construction was hired to make these plans a reality. The front and rear of the store were given a new look designed to fit in with the overall look of the downtown section of Manteo. 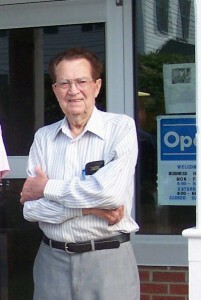 In June of 2007, Roy Wescott Sr. passed away with his share of the company being passed along to his son. In January of 2008 Roy Wescott Jr. decided it was time to retire and sold his stock to Ken. This left Bill and Ken Daniels, father and son, as the sole owners of Manteo Furniture Company. Roy Jr. is actively involved in the church as the organist and part of a church music ministry playing in a band that travels to other churches and groups in the area. In the fall of 2008, the stock market plummeted as a result of lax banking regulations allowing risky loans. Property values dropped and new construction came to halt even though interest rates dropped to almost nothing. Everyone had to cut back on spending and employees. Unemployment rose to above 10%. After scaling back a little, Bill and Ken decided it was time to do a little remodeling that had long been neglected. 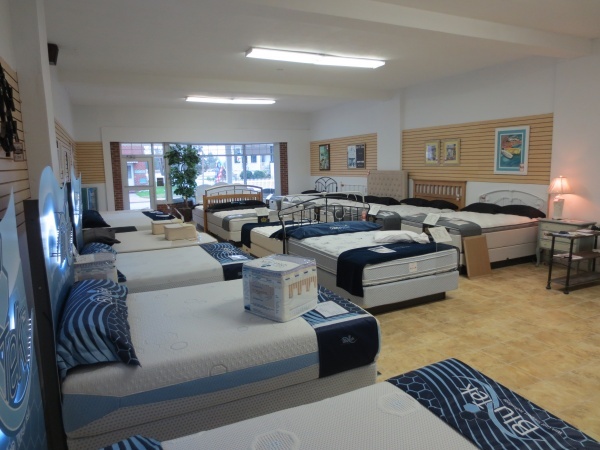 Manteo Furniture provided the materials, but the employees did all the labor over the slow winter season. Carpet was added to the large showroom in the back. Five heat and ac systems were replaced. One area of warehouse was converted to additional showroom space. 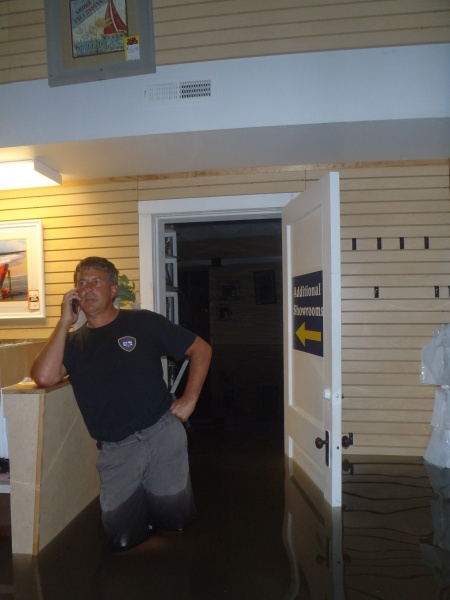 In 2011, the store suffered a significant amount of flooding as a result of Hurricane Irene. The rising water lacked only 8 more inches before it would have reached the top of “the ramp” and our showroom filled with merchandise. Luckily we were fortunate and the waters receded. We replaced carpet, repaired soggy drywall and had the store back to a somewhat shoppable state in the following days. We took the long way around Stumpy Point to deliver much needed Mattresses & Appliances to our cut-off Hatteras Island & Ocracoke homeowners. Not letting storms get to us, we expanded again and by 2012 we added a 1500sq.ft. showroom complete with a water view. As with any business, success is largely attributable to the employees, past and present. 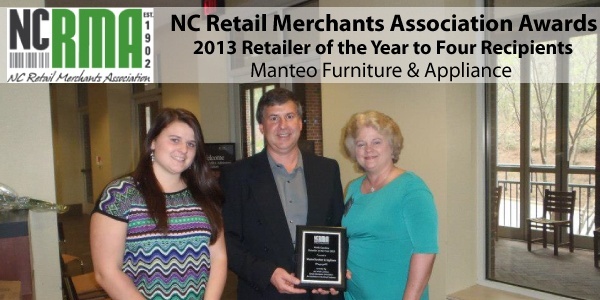 Manteo Furniture Company has been extremely fortunate over the years to have obtained such competent and dedicated employees. It is to them that a special salute and tribute should be made, for without them, regardless of the efforts of any owners, Manteo Furniture Company would not be where it is today. It would be very amiss not to give special mention to Mr. George Meekins, an employee of 32 years, formally of Avon, later Point Harbor. Mr. Meekins was a most loyal and dedicated employee and friend to many, many people as well as to the Manteo Furniture family. Retirement was an option for Mr. Meekins for several years, but through devout dedication, he chose to continue working until cancer raised its ugly head and he was no longer physically able to drive to work. George succumbed to the cancer in August 1993. George, we miss you. QUIPS OF NOTE When Edward Wescott was a small child, the small children his age had trouble saying “Eddie” and pronounced it “Abbie” which was picked up and later shortened to “Ab”. When Roy Wescott was a teenager and the fishing season was on hold, his father, Lloyd, went to a friend of his who was in the building business. Mr. Lloyd asked him if he could use Roy for a period of time. Mr Lloyd told him Roy was inexperienced and not to pay him full wages just because they were friends. “Just pay him what he is worth to you”. When Roy brought home the first paycheck, his father looked at it, went to his friend and said that he asked him to not pay Roy full wages because he was so inexperienced. The contractor replied “Captain Lloyd, he may not be good, but he sure is fast”. Hence the nickname “Speedy”. In a conversation between Roy, Jr. and his grandmother Lonie, she was telling him about the time she was “with child” for the 3rd time. She said that she fixed up the baby room with pink, had pink dresses and was ready for the little girl to be born, and “when she was born, we named her ‘Fred’. In a conversation with the mate on his boat, the mate asked Captain Lloyd if it wouldn’t be nice if the government would collect all the money in America and “whacked” it up even among everybody. Captain Lloyd responded, “I don’t know. I figure that the ones that had it before would soon have it again. ” In a conversation between Roy, Jr. and his grandfather Captain Lloyd, Roy, Jr. asked him if there was anything he liked better than a Chesterfield cigarette. Captain Lloyd thought for as second and responded, “No, not unless it was 2 of them”. In the early beginnings, a living room suit arrived at the store. Fred, in speaking with his father, Captain Lloyd, commented on how pretty the living room suit was and then stated that it was a really good price. Captain Lloyd said that the “good price depended on whether you were buying or selling”. Captain Lloyd’s brother, Johnny M. Wescott, married his wife Lonie’s sister, Eugenia Midgett. Sister’s married cousins, blood related on both sides of the marriages.brothers. This resulted in the offspring being double first cousins, blood related on both sides of the marriages. 2019, Proudly Celebrating 74 Years Serving the Outer Banks.